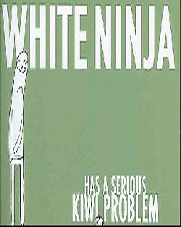 White Ninja Has a Serious Kiwi Problem is 208 pages of white-hot, White Ninja action. It begins where the last volume left off. It includes some alternate versions of your favorites, just like you would find in the bonus features of your favorite dvd. And David Malki! of Wondermark has provided a short piece of prose about White Ninja in place of a foreword (because forewords are boring).